The traditional choice of commercial and fine artists throughout the world. Thick, soft leads made with permanent pigments are smooth, slow wearing, blendable, water-resistant and extremely light-fast. 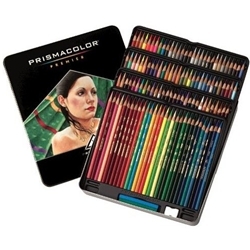 They are packaged in convenient sets of 12, 24, 48, 72, 120 or 132 assorted colors. Sets are packaged in tins for easy storage and transportation. Individual colors are available as well.